It’s a big day for author/illustrator birthdays! Birthday greetings to Jack Prelutsky, the first U.S. Children's Poet Laureate and author of The New Kid on the Block, It’s Raining Pigs and Noodles, and many other books of poetry. Best birthday wishes to Jon Scieszka, the first National Ambassador for Young People’s Literature (named by the Library of Congress in 2008), author of The Stinky Cheese Man, Time Warp Trio series, The True Story of the Three Little Pigs and the autobiographical Knucklehead. Also, happy birthday to Byron Barton (Dinosaurs, Dinosaurs, Machines At Work), Jeanie Adams (Pigs and Honey), and illustrator Michael Hague (A Child’s Book of Prayers, The Teddy Bears’ Picnic). Richard Drew invents Scotch tape in 1930. The Old Man and the Sea by Ernest Hemingway is published in 1952. The television show Star Trek premieres on NBC in 1966. It’s International Literacy Day, highlighting efforts to provide the opportunity for all people, all over the world, to learn to read. Read Booktalking Around the World: Great Global Reads for Ages 9–14 by Sonja Cole. It’s Pardon Day—a time for seeking forgiveness (because we all make mistakes) and remembering to say "Excuse me!" Read Excuse Me, But That Is My Book by Lauren Child. Over the last two months, we’ve been looking at some optimistic books about a child going back to school. Whether it is The Magic School Bus or Kindergarten Diary, these books end happily with their protagonists very satisfied to be in school. But for some children, school may be a bit more of a challenge. For teachers, these children can often prove trying. Later this month we will look at Jack Gantos’s Joey Pigza series. Today I’m going to focus on a character created by David Shannon, his alter ego, in David Goes to School. While adult readers might find themselves exhausted, feeling sorry for this poor teacher, children will see a bit of themselves—or at least enjoy watching a book character do what they might like to do. Grown-up David Shannon has executed the book with humor and an amazing memory of childhood. With fanglike teeth and a smile as wide as his face, David wins over all his readers in the end. And the book functions as a way to introduce basic school rules. For this very reason many teachers love to open the school year with it because the ending makes quite clear that although bad behavior will be scolded, good behavior will be praised. Both in No, David! 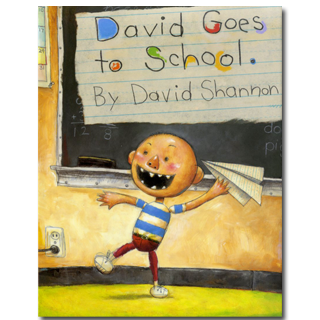 and David Goes to School, David Shannon has executed picture books that keep readers laughing from the first page to the last. He has clearly never forgotten what it feels like to be a child on those first days of school. Originally posted September 8, 2011. Updated for . My 4 year old who is getting ready to start preschool loves this book. 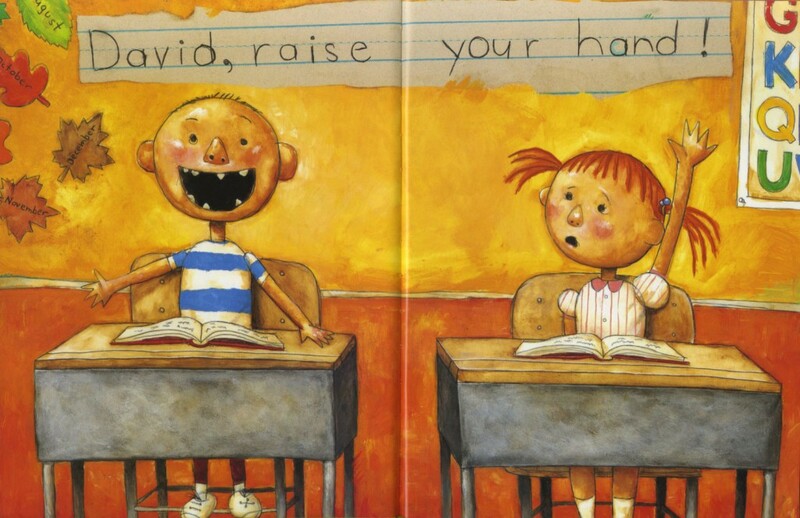 It was also a favorite of my first grade class when I was teaching first grade….I actually think I had several “David’s” in that group. It is a fun story, the illustrations create interest, and the text is simple enough to engage prereaders, and emergent readers. I’ve been looking forward to the review of this book–it’s one of my favorites. I find it interesting that a children’s book describes the exact opposite of any child I was in school with. I was a quite child, but it would never have occurred to me to be fearless enough to act out in class in any way. It would have scared me witless to even consider acting up in the classroom. We love David!! We read them over and over at my house. My 4-year-old boy belly laughs at David’s antics and I love to hear him chuckle. All the David books are such a treat – wish there were even more!!! You use the phrase that people often do to describe children’s reactions to these books “belly laugh.” We need more books that do that!